I pre-ordered this one for my Kindle, because the thought of waiting a few days more to start reading it were unacceptable to me. Now, after reading it, I consider that a wise decision indeed. The Ocean at the End of the Lane is about the remembered adventure of a young boy (entirely unnamed) in a world he barely understood at the time and has less hope of understanding as an adult. It starts with an opal miner, who wishes unwisely and releases something old and powerful, cunning and malicious. Something that finds its way into the boy's life in a most frightening form: a beautiful babysitter everybody, especially his father, loves, but only the boy can understand the truth about her. The boy's one hope are the Hempstock ladies from the farm at the end of the lane: Lettie Hemptstock, a girl a few years older than him, her mother, and her grandmother. Maiden, mother, and crone, a symbol Gaiman has used quite a bit in his work. They have an ocean, which is also a farm pond, and they've come from the Old Country, the one that sank. They are strange and powerful and mysterious in equal measure, and though they let the boy see and understand some of themselves, there's much of them that remains unseen and unknown and, I think, unknowable. This is one of those books that's hard to classify. I'd call this an adult book, though the narrator is describing things that happened to him as a child. There's a level of nostalgia and remembering that I think adult readers will understand best. I think this would have been a very different book if the narrator had still been a child, and not an adult remembering his childhood. My review should probably be taken with a grain of salt. 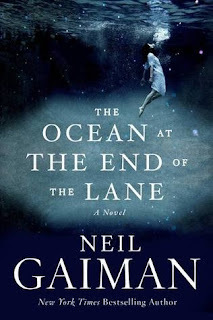 Obviously, I love Neil Gaiman, I love his style and narrative voice. (And his reading voice, as well. I also ordered this as an audiobook.) It was a foregone conclusion that I'd love it, and I did. I had been in a bit of a reading slump before I picked up The Ocean at the End of the Lane, and I'm pleased to report that it woke me up, from the very first page. I love it when I can feel a book, even if it's scaring me. More than once, I realized only at the end of a scene that I'd been holding my breath. I think that's the best thing that I can say about this book, that it made me react physically to what I was reading.